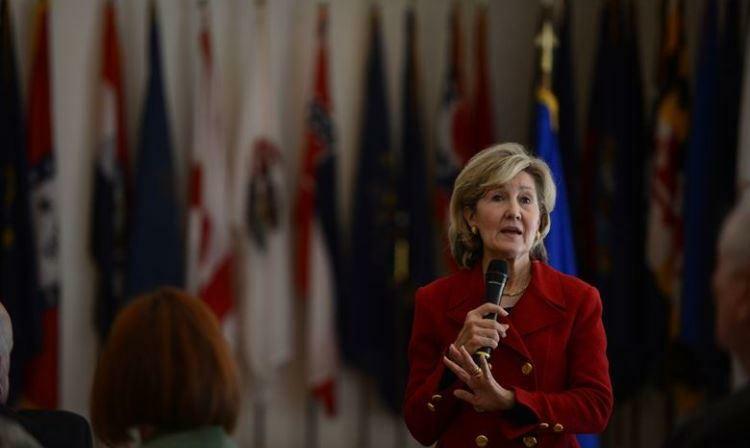 US Ambassador to NATO Kay Bailey Hutchison is a highly placed diplomat. Her words, whatever they may be, are official, which includes the ultimatums and threats that have become the language increasingly used by US diplomats to implement the policy of forceful persuasion or coercive diplomacy. Bellicose declarations are being used this way as a tool. On Oct. 2, the ambassador proved it again. According to her statement, Washington is ready to use force against Russia. Actually, she presented an ultimatum - Moscow must stop the development of a missile that the US believes to be in violation of the Intermediate-Range Nuclear Forces Treaty (INF Treaty). If not, the American military will destroy it before the weapon becomes operational. “At that point, we would be looking at the capability to take out a (Russian) missile that could hit any of our countries,” Hutchison stated at a news conference. "Counter measures (by the United States) would be to take out the missiles that are in development by Russia in violation of the treaty," she added. "They are on notice." This is nothing other than a direct warning of a preemptive strike. It is true that compliance with the INF Treaty is a controversial issue. Moscow has many times claimed that Washington was in violation, and that position has been substantiated. For instance, the Aegis Ashore system, which has been installed in Romania and is to be deployed in Poland, uses the Mk-41 launcher that is capable of firing intermediate-range Tomahawk missiles. This is a flagrant breach of the INF Treaty. The fact is undeniable. The US accuses Moscow of possessing and testing a ground-launched cruise missile with a range capability of 500 km to 5,500 km (310-3,417 miles), but there has never been any proof to support this claim. Russia has consistently denied the charges. It says the missile in question — the 9M729 — is in compliance with the provisions of the treaty and has never been upgraded or tested for the prohibited range. This is a reasonable assertion. After all, there is no way to prevent such tests from being detected and monitored by satellites. The US could raise the issue with the Special Verification Commission (SVC). Instead it threatens to start a war. This is momentous, because the ambassador’s words were not a botched statement or an offhand comment, but in fact followed another “warning” made by a US official recently. Speaking on Sept. 28 at an industry event in Pennsylvania hosted by the Consumer Energy Alliance, Interior Secretary Ryan Zinke suggested that the US Navy could be used to impose a blockade to restrict Russia’s energy trade. "The United States has that ability, with our Navy, to make sure the sea lanes are open, and, if necessary, to blockade... to make sure that their energy does not go to market," he said, revealing that this was an option. The Interior Department has nothing to do with foreign policy, but Mr. Zinke is a high-ranking member of the administration. Two bellicose statements made one after another and both are just short of a declaration of war! A blockade is a hostile act that would be countered with force, and the US is well aware of this. It is also well aware that Russia will defend itself. It’s important to note that no comments or explanations have come from the White House. This confirms the fact that what the officials have said reflects the administration’s position. This brings to mind the fact that the Interdiction and Modernization of Sanctions Act has passed the House of Representatives. The legislation includes the authority to inspect Chinese, Iranian, Syrian, and Russian ports. Among the latter are the ports of Nakhodka, Vanino, and Vladivostok. This is an openly hostile act and a blatant violation of international law. If the bill becomes law, it will likely start a war with the US acting as the aggressor. Trident Juncture, the largest training event held by NATO since 2002, kicks off on October 25 and will last until November 7, 2018. It will take place in close proximity to Russia’s borders. Russia’s Vostok-2018 exercise in September was the biggest seen there since the Cold War, but it was held in the Far East, far from NATO’s area of responsibility. It’s NATO, not Russia, who is escalating the already tense situation in Europe by holding such a large-scale exercise adjacent to Russia’s borders. Russia is not the only country to be threatened with war. Attempts are being made to intimidate China as well. Tensions are running high in the South China Sea, where US and Chinese ships had an "unsafe" interaction with each other on Sept. 30. A collision was barely avoided. As a result, US Defense Secretary James Mattis had to suspend his visit to China when it was called off by Beijing. The security dialog between the two nations has stalled. Perhaps the only thing left to do is to give up on having a normal relationship with the United States. Ambassador Hutchison’s statement is sending a clear message of: “forget about diplomacy, we’re back to the Stone Age,” with Washington leading the way. This is the new reality, so get used to it. Just shrug it off and try to live without the US, but be vigilant and ready to repel an attack that is very likely on the way. It should be noted that Moscow has never threatened the US with military action. It has never deployed military forces in proximity to America’s shores. It did not start all those unending sanctions and trade wars. When exposing the US violations of international agreements, it has never claimed that the use of force was an option. It has tried hard to revive the dialog on arms control and to coordinate operations in Syria. But it has also had to issue warnings about consequences, in case it were provoked to respond to a hostile act. If the worst happens, we’ll all know who is to blame. Washington bears the responsibility for pushing the world to the brink of war.